The U5303A digitizer and the U5340A FPGA development kit are recent enhancements to Agilent Technologies’s PCI Express (PCIe) high-speed digitizers. The U5303A and the U5340A FPGA add next-generation real-time peak detection functionalities to the PCIe devices. The U5303A is a 12-bit PCIe digitizer with programmable on-board processing. It offers high performance in a small footprint, making it an ideal platform for many commercial, industrial, and aerospace and defense embedded systems. A data processing unit (DPU) based on the Xilinx Virtex-6 FPGA is at the heart of the U5303A. The DPU controls the module functionality, data flow, and real-time signal processing. This feature enables data reduction and storage to be carried out at the digitizer level, minimizing transfer volumes and accelerating analysis. The U5340A FPGA development kit is designed to help companies and researchers protect their IP signal-processing algorithms. 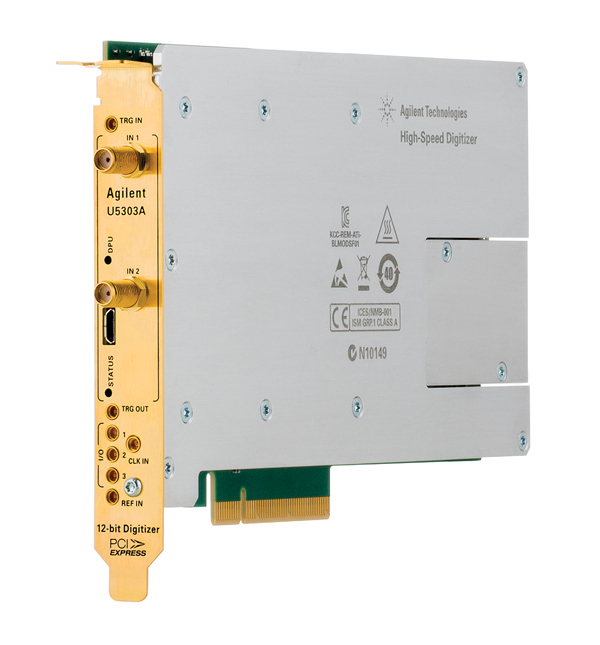 The FPGA kit enables integration of an advanced real-time signal processing algorithm within Agilent Technologies’s high-speed digitizers. The U5340A features high-speed medical imaging, analytical time-of-flight, lidar ranging, non-destructive testing, and a direct interface to digitizer hardware elements (e.g., the ADC, clock manager, and memory blocks). The FPGA kit includes a library of building blocks, from basic gates to dual-port RAM; a set of IP cores; and ready-to-use scripts that handle all aspects of the build flow. Contact Agilent Technologies for pricing.